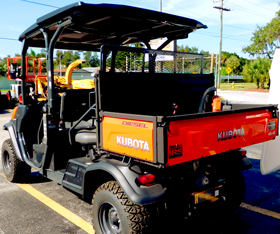 The RTV-X1140 is Kubota’s most versatile utility vehicle yet! Designed to adapt to your needs, this model easily transitions from hauling cargo in the hydraulic dumping bed to transporting friends and family with a second row of seating. 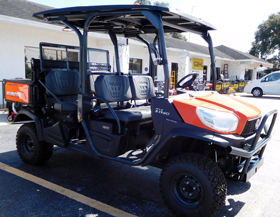 Packed with convenient features and powered by a proven 24.8 HP Kubota diesel engine. Available in Realtree AP camouflage. The RTV-X1140 offers a variety of standard and optional features to enhance productivity and operator comfort. Options include alloy wheels and a factory-installed bed liner to protect the cargo bed from dirt and damage. Driving comfort comes standard with an ergonomically-designed, split-bench style seat designed to provide hours of smooth riding. 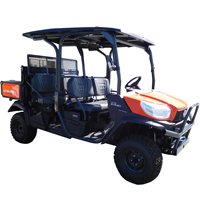 With sophisticated technology and easy-to-operate features, the RTV-X1140 offers a digital meter cluster with bright, easy-to-read indicators to keep the operator informed of critical driving conditions, including speed, hours, and miles traveled. Secure lockable storage is king with a large glove box on the passenger side and under-seat storage compartments beneath the split-bench seats to provide convenient storage space for tools, tie-downs, and personal items. Reposition the sides of the bed: swing the front side panels of the cargo bed towards the back of the bed and fold down the front panel. Reposition the cargo bed: next, lift the front of the cargo bed and secure it. Reposition the protective screen and bench seat: next, move back and secure the protective screen with back rest. Finally, lower and secure the bench seat. Reverse these three steps to restore the RTV-X1140’s full-length bed. Standard Hydraulic Dump Bed: Dump sand, gravel, turf, or just about anything you can think of, from the RTV-X1140’s whopping, 19.1 cu. ft./9.9 cu. ft. (two-seat and four-seat configurations, respectively) capacity cargo bed. An easy-to-operate lever activates this hydraulic bed-lift system in either two or four-seat configuration. Power when and where you need it: Even when the trail disappears, you can rely on the RTV-X1140 powerful diesel engine to keep you moving forward. Kubota-built and trail-proven, these 3-cylinder liquid-cooled diesel engines have a well-earned reputation for dependable performance even in the harshest terrains. The RTV-X1140 comes with a robust 24.8 HP engine. VHT-X (Variable Hydraulic Transmission): Kubota has more experience in variable hydraulic transmissions than any other Utility Vehicle manufacturer. Kubota’s advanced VHT-X offers a wide torque band and large oil cooler that boost performance and durability. Front & Rear Independent Suspension: Regardless of the terrain or load, independent suspension on all four wheels ensures a truly exceptional ride. Kubota’s Extra Duty IRS (Independent Rear Suspension) technology also sets a new standard for durability. High Ground Clearance: The new X1140 raises the bar on ground clearance—to a full 10.8” with 8” of suspension travel—letting you glide over the bumps rather than through them. Limited-Slip Front Differential: True 4-wheel drive with a limited-slip front differential and a locking rear differential help reduce wheelspin to a minimum, giving you greater control and a smoother ride on rough or muddy terrain. 20% Larger, Clog-resistant Radiator: Open the hood, and you’ll find the radiator and air-intake located high and up front, where the air is cleaner and cooler. This improves both radiator performance and simplifies maintenance. Kubota’s wide fin pitch design minimizes clogging, further improving radiator performance. Towing Capacity: Standard two-inch hitch receivers at the front and back let you tow up to 1,300 lbs. of gear. Newly Designed ROPS: The poles at the rear have been eliminated for a cleaner look and easier cargo loading from the sides in the 2-seat configuration. A 5th pole has been added in the rear middle of the frame to ensure the same high level of ROPS performance that meets the SAE J2194 and OSHA 1928 ROPS standards. More Comfortable Rear Seat: More legroom for the backseat passengers means more comfort and less fatigue, especially on long journeys. Your crew will arrive fresh and ready for action. 60:40 Split-bench Seats: The split-bench style seat is ergonomically designed to provide hours of riding comfort. The driver’s side is adjustable fore and aft. Power Steering: Responsive hydrostatic power steering gives you the control you need to tame any terrain. The steering wheel is tilt-adjustable, allowing you to set the optimum angle for your driving style. Digital Meter Cluster: Bright, with large, easy-to-read indicators, this digital meter cluster keeps you informed of all critical driving conditions, including speed, hours, and miles traveled. An Overheat Alarm (light and audio) helps prevent engine damage. Easily accessible Parking Brake: The parking brake is conveniently located on the dashboard for easier access as well as more legroom. Glove Box: A large glove box on the passenger side provides fast access to critical tools and personal effects. Under-seat Storage Compartments: Large compartments under the split-bench seats provide plenty of convenient storage space for tools, tie-downs, and personal items.